So the US edition is in fact the true first. 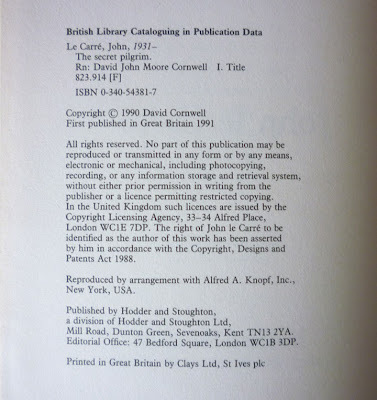 Of course, none of that quite gets to the nub of the matter, namely why I own two copies of the same book – although on past – and indeed recent – evidence, I suppose that shouldn't be terribly surprising. Fact is, I picked up the British first edition for a quid in a Lewes charity shop, and then shortly after that spotted the American first on a cheap books table outside a Cecil Court bookshop. 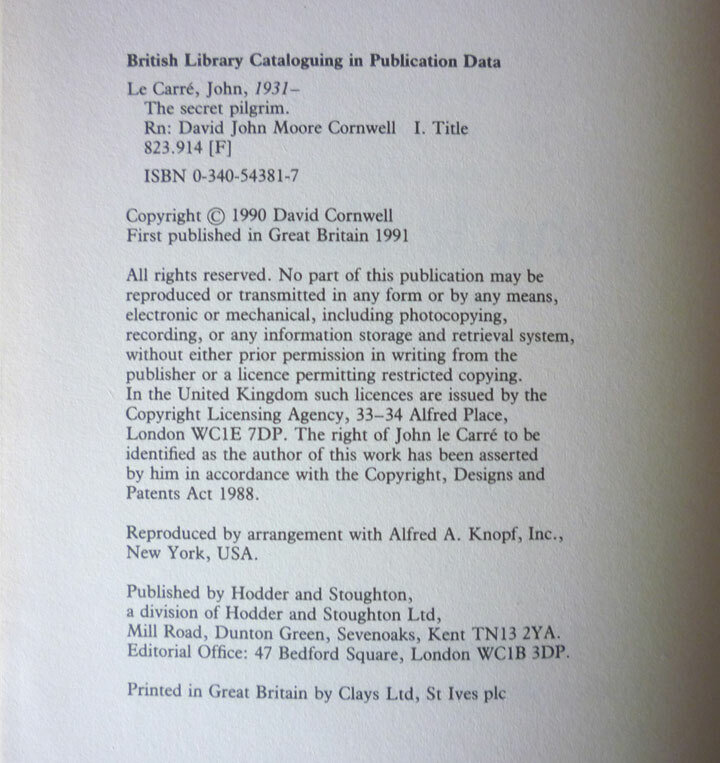 Suffice to say, since I'd always rather have a true first edition (and I prefer the deckled page edges of the US edition and its R. D. Scudellari-designed dustjacket), I'll be releasing the British one back into the wilds shortly, donating it to my mum's forthcoming Beckenham Book Fair, which is taking place at Beckenham Baptist Church, Elm Road, on 12 November, and which was inspired in some small part by my books obsession. 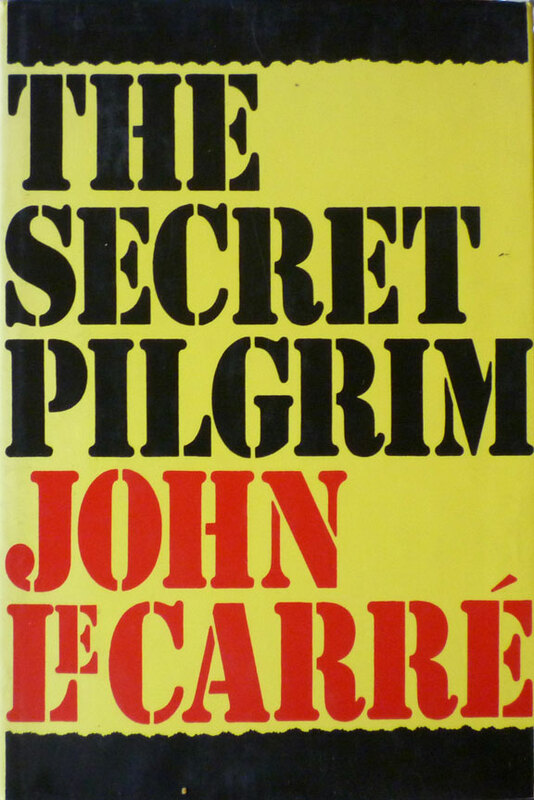 The Secret Pilgrim does, as I say, mark George Smiley's last literary hurrah (to date, anyway), but it's actually narrated in the first person by Ned (no surname), a British intelligence operative in the twilight of his career whose task it is to train the next generation of spies. And to their Sarratt passing-out dinner at the end of their training course, Ned has invited as guest of honour... George Smiley. 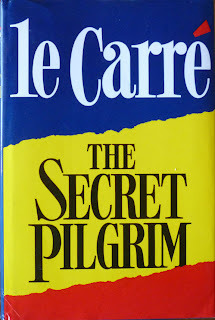 I haven't read The Secret Pilgrim myself, but my estimable friend and colleague – and noted le Carré aficionado – Roly Allen, has, and reckons it's "a minor work in the canon, but very good fun and it fleshes out the Circus mythology very nicely. 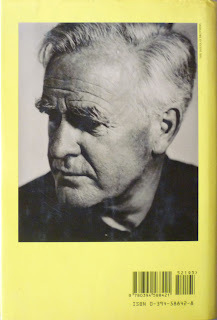 One gets the impression that le Carré wanted to use up a bunch of short story ideas (based, apparently, on real incidents) and give Smiley a final (final) goodbye (Smiley retires more times than Frank Sinatra) and hit upon Ned's career structure as a way of doing so." It does of course touch upon the usual le Carré themes. There's that clever sensitive young lady with the nice bum and an overdeveloped conscience, again! (Actually – yay – there are two! And one of them is sexually adventuresome!) There's the remote house on the Atlantic Coast, again! There are the (two!) stories hingeing on is-he-one-of-ours-or-one-of-theirs, again! There's that Bildungsroman-of-the-middle-aged-man trope, again! But hey, who cares. It's jolly good nonetheless. And Smiley has one line which has really stuck with me – which is his take on the end of the Cold War – which a lot of people would do well to remember, especially when they are erecting statues of Ronald Reagan in London and not mentioning Gorbachev once. 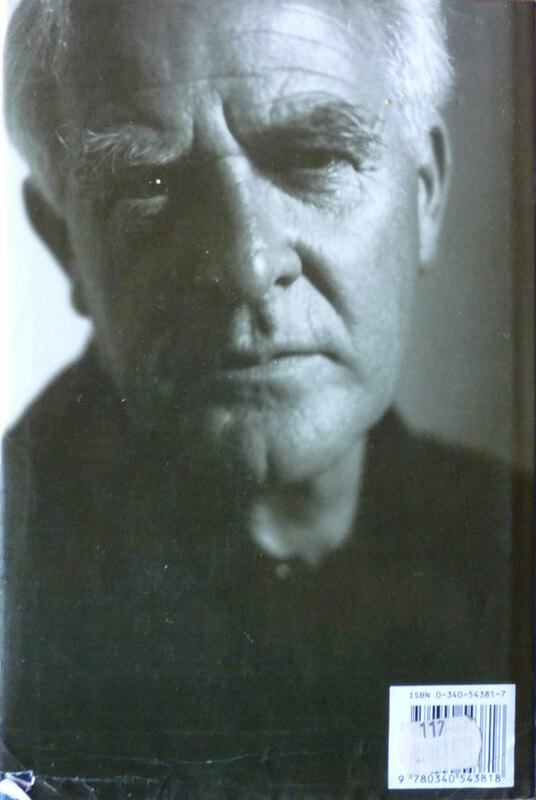 "It was their emperor, not ours, who had the nerve to mount the rostrum and declare that he had no clothes". Ultimately the Cold War ended because the Russians chose to end it: an "impossible event" which many people still cannot quite compute. (Not that Gorbachev can't have been a saint: he was of course a loyal party functionary for three decades before glasnost, etc). Greatly enjoyed your Smiley week, some great reviews! Thanks a lot! 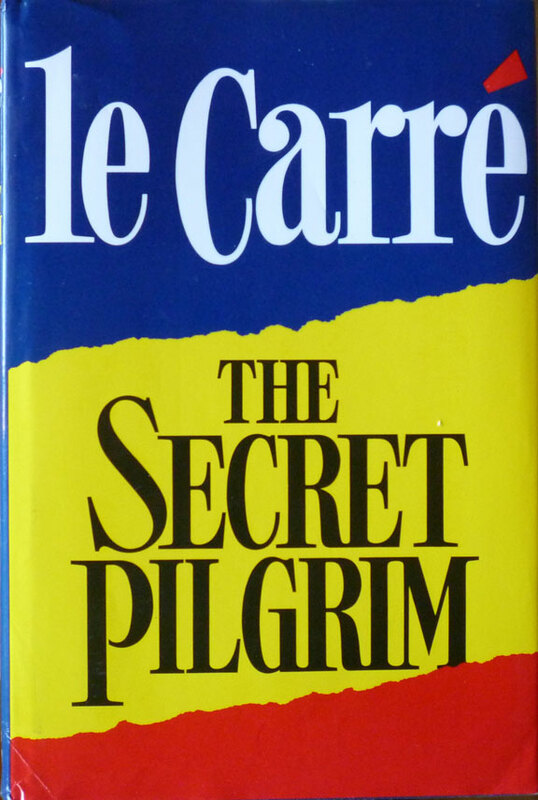 That said you simply have to check out A PERFECT SPY, le Carré's best and most autobiographic work that blends his own background with the tale of a traitor and offers some thought-provoking insights into le Carré's world. It stands head and shoulders above THE SECRET PILGRIM and in a way also revisits TTSS, but this time takes the traitor's POV. If you get a chance, you should have a listen to Radio 4's Smiley plays - they do a great job of capturing the paranoid, slightly seedy atmosphere of the books. Thanks, Robert. A couple of other folk also pointed me in the direction of the Radio 4 plays, so I think I'll give them a whirl soon.